HITS V Ocala Winter Festival was filled with lots of sunshine and ribbons. Libby LeStage won a Junior Hunter class with DiaDora. Libby was Reserve Champion in the Junior Hunter's and finished 5th in the $5,000 Devocoux Hunter Prix. They were also 3rd in the THIS medal in a huge class on the grass. 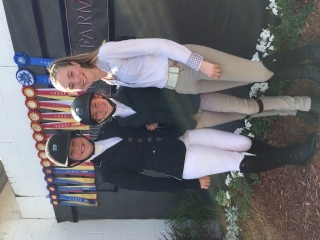 Lafayette Park and Grace Debney won all of their large Green Pony classes. Isabel Hunt and Blue On Bye were Reserve Champion in Maiden Equitation. Lily Rusis and Lincom's Close Up were Champion in the Intermediate Equitation. Zorvino and Tricia O'Connor were 1st, 2nd and 2nd in the Hits 2 Hunter's. Clearly and Alexa Bayko got great ribbons in the 3'3" Amateur Owner's 18-35 and Modified Amateurs. Einstein and Lily Rusis made their debut in the 3'3" Small Juniors with some good ribbons. Isabel Hunt and Whisper were pretty cute together in the 11/U Equitation. Lily Rusis borrowed Redfield's DA Bjorn for some jumper experience. And Libby LeStage got some great experience in the equitation with Brittany Hurst's Ovation de Revel.